Painted wood signs are a hot new trend in farmhouse, rustic, and country style decor. If you go on Etsy and search for "wood signs" you will get upwards of 250 PAGES full of signs for sale. Some have vinyl lettering on painted wood, but those aren't nearly as popular as the all painted wood signs. BUT, if you struggle like I do with painting a straight line, it can be a daunting task to try and make your own wood sign. That's where products like our vinyl stencils come in to play. They make wood signs an "easy peasy lemon squeezy" kind of project! Want to see just how easy it is to use one of our vinyl stencils to create your own hand painted wood sign? Check out the latest video we added to our YouTube channel and see for yourself! Now do you believe me? 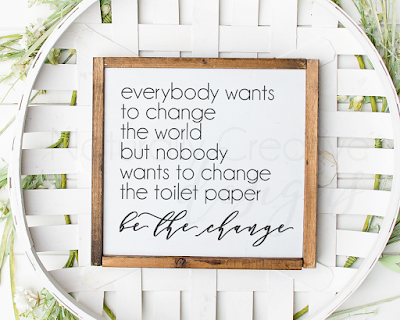 Whether you buy a vinyl stencil from us, or use your own vinyl cutter and design to create your own sign, I hope that you have discovered just how easy it can be to add a little homemade farmhouse touch to your decor! * If you would rather purchase a painted wood sign, you can find them in our Etsy Shop.